While experts have always advocated the flu shot as a means for flu prevention, especially for children and seniors, the 2014-15 vaccine was only 19 percent effective, according to the U.S. Centers for Disease Control and Prevention. Though the vaccine had one of the lowest efficacies in the past decade, this statistic reveals that vaccination alone cannot mitigate the harmful effects of flu season. It’s necessary, but not comprehensive. 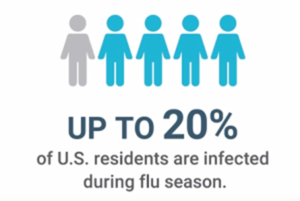 Surface cleaning and handwashing aren’t enough to stop the flu from spreading either, because the main route by which the flu passes from person to person is the air. To really reduce the burden caused by flu season, cleaning indoor air is essential. People with the flu often stay home from school or work to prevent the virus from spreading, but unfortunately an infected person is contagious before symptoms are in full effect. One sneeze or cough can send thousands of infectious particles into the air. Most of these small particles remain in the air for hours and travel long distances. In fact, some of these particles can even travel through a building’s HVAC system, according to an official position statement released by ASHRAE. This means that an infected individual could be long gone from a room by the time he or she transmits the influenza virus. To prevent this from occurring, facility managers need to remove infectious particles from shared airspace. As more people catch the flu, the presence of airborne infectious particles quickly multiplies, especially in common areas such as schools and offices. Since these particles spread the virus by being inhaled, it doesn’t matter how much occupants wash their hands or clean off surfaces. This is where commercial air purifiers come into play. AeraMax Professional air purifiers effectively eliminate 99.9 percent of infectious influenza particles from shared air in only 35 minutes. In a special report, AeraMax Professional sheds light on the flu and explains how its targeted solution creates healthier and cleaner facilities.